An appeal to people who view this page. The picture is large so you can see the faces of the people clearly. Please identify the people for me. The picture is of F. Ad. Richter and his family. 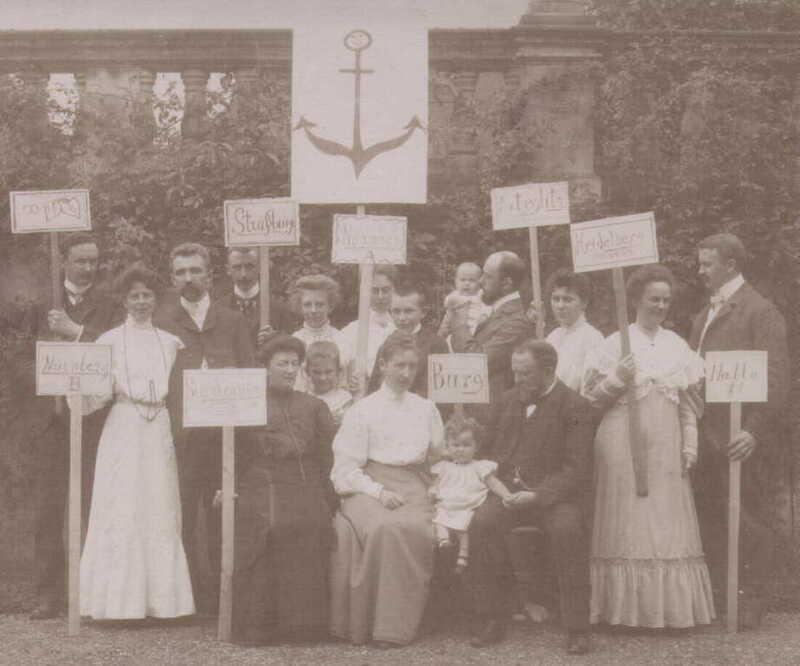 In the center (identified by the sign "Burg") are Richter himself, his second wife (Caecilia), and his daughter Eva. Eva was born on January 11, 1904, so the picture was probably taken in 1905. At Else's wedding? Richter's eldest daughter (Clara, 35 in 1905, married in 1889) lived in Nuremberg and had three children. I assume she is the woman holding the sign "Nürnberg A" in her right hand. Else (married in 1905 at 26 years of age, lived in Nürnberg) is probably holding "Nürnberg B". (It looks to me as if Else's left hand is behind her back holding the right hand to the man behind her.) Johanna (31, never married) had a PhD in Sanskrit, and the "Heidelberg" sign includes a line of Sanskrit. Richter's other children were Lina (33, not married yet), Dolf (32, not married yet), Walter (25, not married yet), Kurt (23, not married yet), and Oskar (20, married in 1904). The hard-to-read signs say "Blankenburg" and "Steglitz". AV Ernst Offerman, of Haarlem, Netherlands, has built some of the most impressive exhibition buildings ever shown on this web site. His latest construction the Basilica of St. John the Evangelist in Selçuk, Turkey, is his latest masterpiece. The custom stones put this building beyond the capability of any other Anchor friend, but, as usual, they add to the building's overall appearance. In addition, the buildings of the KaDeWe exhibition in Berlin last December are being shown -- one at a time. All models were of famous Berlin buildings. This month the featured building, built by AV G. Hahn, is the Entrance Gate to the Borsig Factory. The new CVA booklets of building plans for set GK-NF # 12 available. It costs $15.00, post paid. Remember that with a purchase of an Anchor set from # 10A and above, including the new 18A, this set of books costs only $10 extra, if I can pack the books in with the set (that is, not mailed to another address). The next CVA meeting will be on Saturday, October 26, 2002. I plan to be there. See the CVA page for details. The CVA has published a Stone Catalog. Again I brought home six copies, in the correct European binder -- $30, ppd. Only two are left. Even if you have no other Anchor reference book, you need to buy this one. This catalog is not, and will not become, available on CD-ROM, and the next update won't be available for many months. The update is concentrating on the contents of the unusual sets. The amount of detailed information is very great, and the information keeps coming in. And it has become clear that e-mails with just numbers will not do; Leo Coffeng must receive a photocopy or scan (in color if at all possible) of the packing plan. CD-ROM Archive: I can supply the CD-ROMs of the CVA's CD-Archive. More scans are being added all of the time, and the "holes" in the documentation are being filled. Of course, more scans means more CDs, and as scans are added some files are moved to other CD. As of today, there are ten CD-ROMs in the Archive, plus, for CVA members only, 6 additional CD-ROMs of the old MLBs. (Do not try to buy these MLB CD-ROMs unless you are a CVA member. I check the membership list.) All of the scans are JPG files. # 1 contains the GK-NF building and layer plans, excluding # 34, the Anchor book in PDF format in English, plus odd things like box covers, figures, insets, rulers, etc. ; # 2 contains the DS and # 34 building and layer plans; # 3 contains all packing plans, the Anchor book in PDF format in German and the web site with index; # 4 contains the building and layer plans for the second series of GK-Br and Imperator, the VE series; # 5 contains the KK building and layer plans, plus Comet, Erste Folge, Eagle, Imperator (all metal) and mosaic plans; # 6 contains documentation including my book in both English and German and various magazines (like the Anker Zeitung) and magazine articles, plus information on other Anchor products (like Lebkuchen, medicines and mechanical music instruments) ; # 7 contains the building and layer plans for the series 100 (Neue Reihe), 200 (Modern [American] House Series), 300 (Landhaus [Country House] sets), 400 (Festungs- und Burgen-Baukasten [fortress and castle sets]), NS, Capital, Täfelchenlegen, games, VEB, LaVelle, Orion, KMBK (Art Model Building Sets), Eisenbrücken, A-B (American Bridges); # 8 contains the building and layer plans for the series GK-AF, the first series of GK-Br, Exhibition models, Richter (includes his will and other documents regarding his estate), Rudolstadt; # 9 Catalogs, Special Sets, pictures of the original factory (perhaps I will add pictures of the new factory, assuming permission is granted); # 10 Personal Designs, plus advertisements and Im (1st series), and # 11 an overview using PDF and other more modern PC programs and formats. Only the members of the Club of Anchor Friends are permitted to purchase the six CD-ROMs containing all of the MLBs (up through Fall, 2001), including both the English and the German language translations. If you want to buy one or more of these CD-ROMs, please send $2 (or euros, your choice) for the first CD-ROM and $1 each for the rest -- postage included, no matter where they are going. CDs are inexpensive, so I do not see a problem if, at this stage of the Archive, some CDs may become obsolete due to relocation of files. For the month of September, 2002.